The Happy Homebodies: Pops of Blue & New Dining Table! It all started when we went to visit my parents over the holidays. 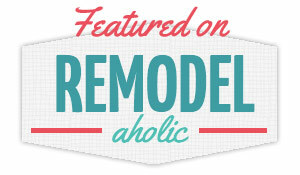 Remember their awesome renovation that I shared with you? Anyway, they had this painting in the guest room that really caught my eye. It was a huge horizontal painting with a vibrant blue/green background, covered with oversized red and yellow blossoms. I told my mom that I loved it, and she said I could have it! Apparently she bought it with a certain room in mind, but it didn't work when she brought it home. She didn't know where to put it, but I knew exactly where I wanted it! I was fairly positive that this frame was exactly the same size as the existing painting we had over the fireplace. I fell out of love with that painting some time ago, but I didn't want to spend money to replace it. Here was a free gift being plopped into my lap, a perfect replacement. The hubby wouldn't even have to put new nails in the wall, since it was exactly the same size as the one we were replacing. The painting is now hanging above our shiny white fireplace. Painting the fireplace really brightened up the room, and this artwork makes the room feel fresh. That's always a nice feeling for the new year– fresh! Once we had the painting in its place, I knew we needed to tweak the existing color scheme a little bit. We didn't have any of that blue/green color in the main living areas, but I thought I could bring in some pops of blue around the room to tie it all together. Spending money was out of the question (hubs and I agreed to have a shopping-free January), so I had to use things I had around the house. By the way, here's that $1,700 Pottery Barn dining table that we snagged at the outlet for $215! You should see it when we have the extensions in to make it nine feet long– it looks like a conference table. That tray on the table is a great Tiffany blue with white trim. What girl doesn't like Tiffany blue? I picked it up on clearance at Marshalls back in the summer. That "LOVE" piece is well-traveled. It's lived in different parts of the house and been different colors. This time I painted it light blue, which is a color reject I picked up at Lowe's. I figured I would find a place to use it, and here it is! I did this watercolor piece a couple of months ago and had it hanging in the guest bedroom. I decided to move it out here for another touch of blue. That G, in case you're wondering, is the guest book from our wedding– one of my favorite things in the house! 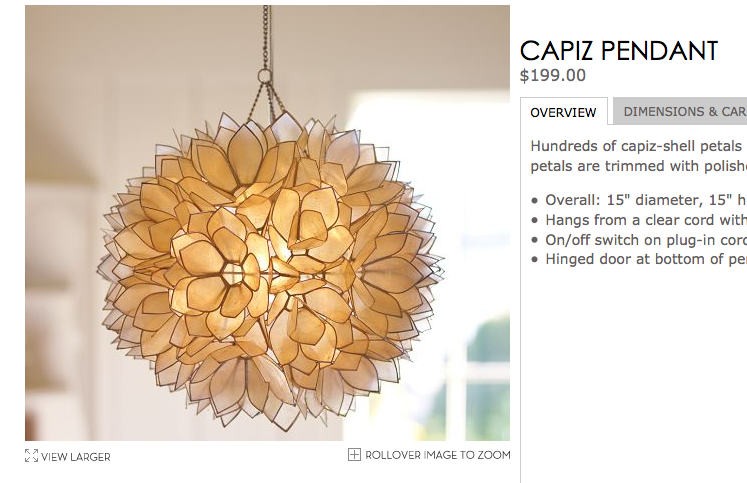 How cool is this capiz thingamabob that I found at HomeGoods? It's a candle holder, but I think it has potential as a chandelier somewhere down the line. For now it will live on our buffet. The last touch of blue is a fabric remnant I had laying in my craft cabinet. Maybe one day I will use my new sewing machine to make it into a runner, but for now it is pinned with safety pins! Haha. I also bought a smaller capiz candle/lantern thingy, and this one came with a hanging chain. It found a home in front of our mirror at the end of the hallway. These capiz fixtures weren't cheap, but I HAD to have them. Ask my shopping buddy Kelsey– it was love at first sight. The bigger one on the buffet was $60, and the smaller one was $40. That's a lot by my standards, but I knew that similar versions like this one at Pottery Barn sell for $200. I'd love to wire mine to be a light fixture down the line, but for now I'll settle for candle holder! I always wanted to freshen things up around the house when I take down the Christmas decorations. New year, new stuff! How do you freshen up your home this time of year?